Craniofacial Pain: What Are My Treatment Options? Craniofacial pain is a term used to describe any chronic facial, neck or head pain; the most common of which is Temporomandibular Joint Dysfunction (TMJ or TMJD). Craniofacial pain may include frequent migraine headaches, earaches, facial-muscle stiffness and fatigue, neck and upper back tension, “lock jaw,” dizziness, or ringing in the ears (tinnitus) — symptoms that can interfere with living fully and enjoying your life. What causes TMJ and other craniofacial pain? Many factors may be involved in causing TMJ and other craniofacial pain, such as bite problems, habitual teeth-clenching or clicking, and overall anxiety — all of which can make complicate effective treatment. At your first visit, your Kaplan physician will take time exploring the onset of your condition, the specific nature of your symptoms and the overall status of your health. You’ll also be asked about the medications and therapies you’ve tried in the past, and what has and hasn’t worked for you. If your pain symptoms warrant it, your Kaplan physician may order specialized diagnostic laboratory testing or refer you to a dental specialist for a bite evaluation. 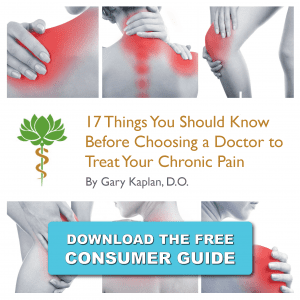 After reviewing all of the factors contributing to your pain problem, your physician will work with you to create a customized and multi-dimensional treatment plan that addresses not only your immediate pain, but also any possible underlying or co-existing conditions that may be causing or aggravating your symptoms.